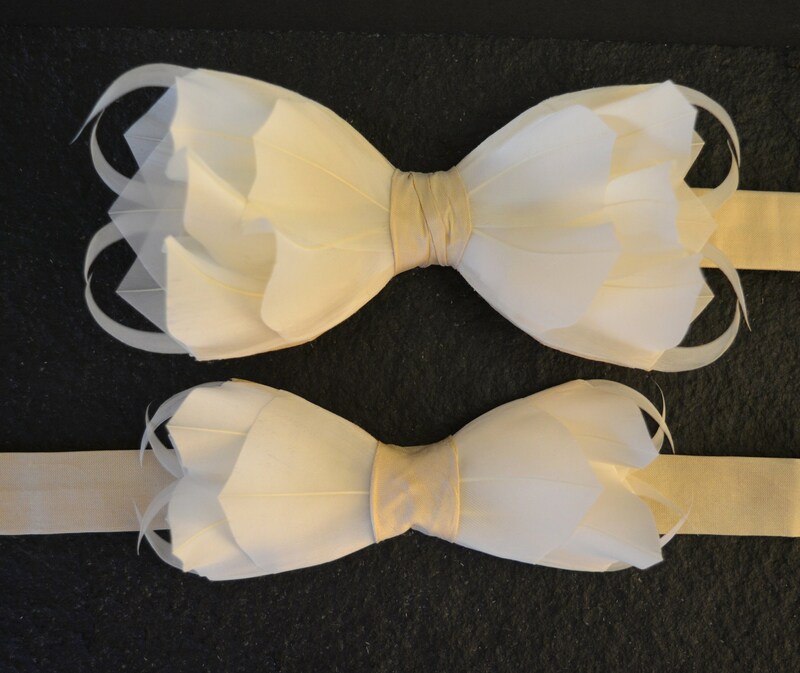 CHAMPAGNE & Ivory 3D Feather Bow Tie. Life’s finer moments are often celebrated with champagne, and for good reason. 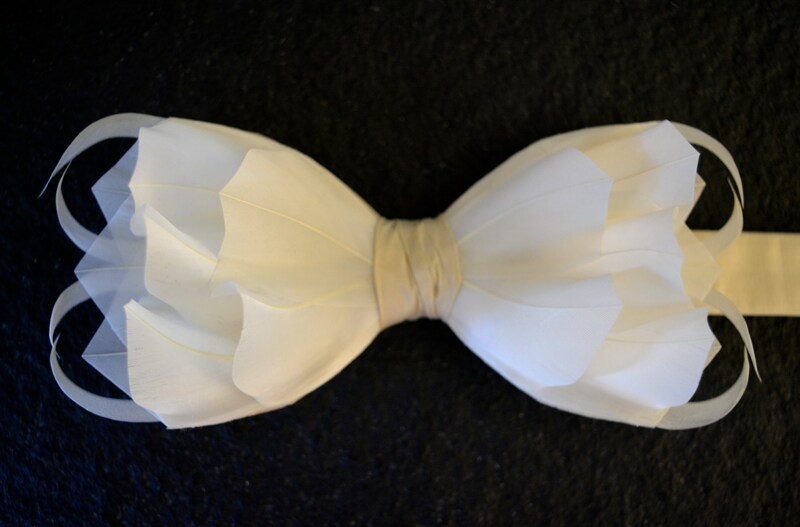 Every Champage must be expertly made, with an exacting detail that ensures outstanding quality, and this Champagne 3D feather bow tie more than fits the bill. Designed by plumassier artist Tracey Telford, this stunning Champagne may be Made In England but it will always deliver the right kind of sparkle to make any outfit to pop. Standing proud from a quality 100% champagne coloured silk double bow tie, and made with genuine natural goose feathers, the Champagne conveys messages of warmth, richness, love, protection and faithfulness. Part of the 2018 Haute Couture range, each hand curled and individually placed feather is so deep and luxurious it appears as though velvet to both the eye and the touch whilst the unique and contemporary high design delivers a ‘spiked edginess’ that cannot fail to make a statement. Being individually hand made, it can also be made available on quality satin. A range of alternative base colours can also be selected, to align with your preferred design aesthetic. 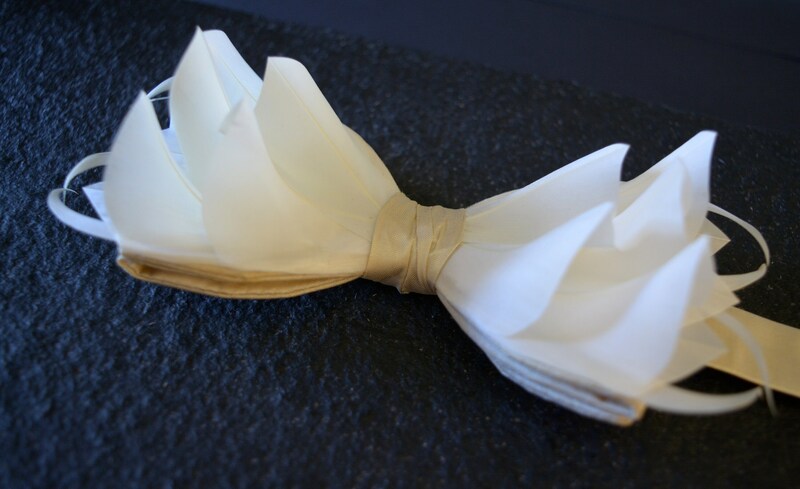 •	The standard size of the handmade bow is approximately 2.5" x 4.5", plus an overlap of feathers of 3/4" each side, making it wider than our standard feather bow ties.